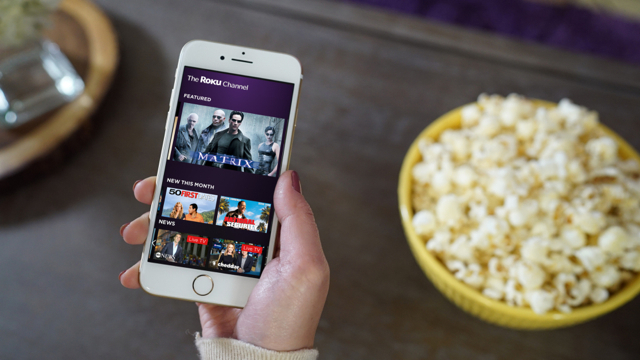 Earlier this month, streaming device maker Roku introduced The Roku Channel — its streaming destination for free, ad-supported movies and TV shows — to non-Roku devices for the first time. The rollout started on the web and select Samsung smart TVs, before plans for a wider cross-platform launch. In addition to updating the navigation for Roku players and Roku TVs to access free TV content, the company plans to bring its service to PCs, smartphones and tablets for those consumers who have not purchased Roku devices. The Roku Channel was launched to help Roku distinguish itself from competitors such as Amazon Fire TV, Apple TV and Chromecast. Now, for the first time, it is using its ad-supported platform to promote its own content. Making the platform available via PCs, iOS and Android opens up major advertising opportunities for Roku (and a new option for cord cutters). “More than any other streaming TV platform, Roku is now trying to establish itself as a source for free, ad-supported video. The big question now is whether that will ultimately come at the expense of ad-free content,” suggests TechHive. Topics: ABC, Ad-Supported, Advertising, Amazon Fire TV, Android, Apple TV, Apps, Chromecast, Cord Cutters, Crackle, CW Seed, FOX, Freeform, Internet, iOS, Lionsgate, MGM, Mobile, Movies, PCs, Pluto TV, Roku, Roku TV, Samsung, Smart TVs, Smartphones, Sony Pictures, Streaming, Tablets, Television, The CW, The Roku Channel, Tubi, TV Shows, Video, VOD, Warner Bros.